Cowaramup is most famous for one thing: cows! Known as ‘Cowtown’ to the locals, this dairy hotspot has heaps of cow (and bull) statues, shops with cow–themed names and plenty of cow-filled farms. And if you’re not a cow lover, you can still enjoy Cowaramup’s wineries, gourmet sweets and quirky shops, as well as the beach at nearby Gracetown. Wot are you waiting for? Get a moo-oo-ove on and book one of our Cowaramup hotels! It might come as a surprise, but Cowaramup’s name is actually pronounced ’Kuh-wara-mup’, meaning ‘place of the Cowara bird’. In any case, dairy farming has been a huge part of life in Cowaramup since it became a town in 1925. You can see this legacy in more than 42 fibreglass bovines scattered through the streets of town. And if that’s not enough cow for you, the ‘Free as a Cow’ statue in Pioneer Park features a golden cow standing on a platform on top of a pole, arms outstretched and ready to fly. The shops and cafes in town have cow-themed names too, so you can expect some udderly fantastic puns. Gifts shops and galleries will let your loved ones know that you’ve been to the place where cows reign supreme. Sweets and chocolate shops will introduce you to the region’s delights like chocolate, fudge and nougat. 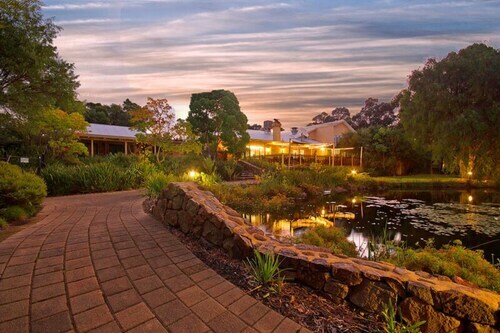 Cowaramup and nearby towns like Wilyabrup and Augusta also have a number of boutique wineries for when you get sick of drinking milk and feel like unwinding a little. Even better, some of them offer a wining AND dining experience so you can sample Cowaramup’s great food at the same time. Take a walk along the Margaret River Cowaramup Rail Trail, which starts at Cowaramup and ends at Margaret River. Once a train track, the trail has trees on either side and passes farms and vineyards, with heaps of bird life along the way. And you can’t miss Gracetown, a little coastal town just a 14 minute drive away. At Cowaramup Bay, which is actually in Gracetown, a road winds past a bushy hillside dotted with houses and offers spectacular views of the blue ocean. The beach is ideal for surfing, swimming or just watching the sun go down. Cowaramup may be Cowtown, but you won’t have any beef with it when you stay there. 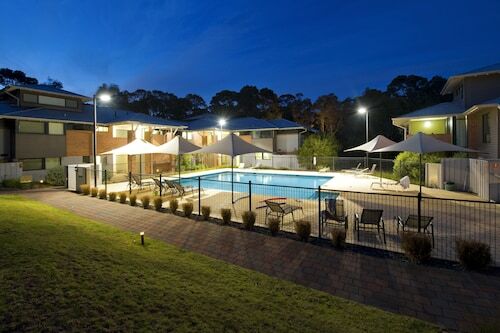 Book your Cowaramup accommodation with us and milk your holiday for all it’s worth! How Much is a Hotel Room in Cowaramup? 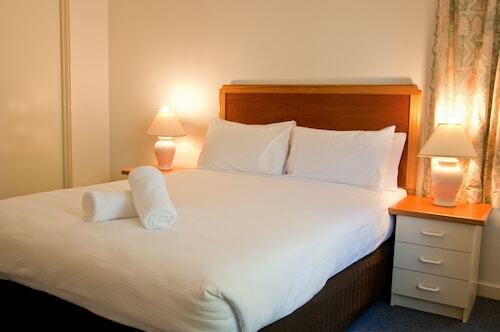 Hotels in Cowaramup start at AU$165 per night. Prices and availability subject to change. Additional terms may apply. Extremely comfortable, large room, and a feeling of being in the country while still quite close to town. For the rate I paid, I thought it would be average. The room was immaculately clean. The resort itself was pristine. Facilities, staff and amenities were all absolutely flawless. The room was lovely- although the bed base was ripped which looked tatty. The outside patio area was really relaxing and the staff were very friendly and helpful. The pool area was gorgeous. The location was fabulous. The sheet over the bath was a struggle as it was a big step in and out and the water pressure was really poor. Overall it was really great. Would stay here again.